Visit the archive to view artwork and merchandise that was available during the Preposterous Parade show. Political art is a provocative creation – artistic social commentary. By combining the political with the artistic, the genre creatively expresses social concerns and often attempts to drive home commentaries that are beyond the boundaries of the written or spoken word. In this way, political art reaches audiences in much more direct and personal ways. Preposterous Parade seeks to provide an alternative point of view of current debates, popular attitudes toward past and present events, and collectively held values and belief systems. 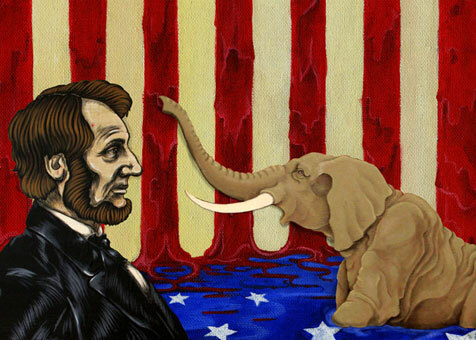 While relying on popular art making conventions – symbolism, satire, propaganda, narrative, humor, and caricature – political artists such as Mike Maxwell and Brian Dombrowsky also constantly experiment with fresh imagery and innovative styles, prompting people to think about politics in a new light. Whether the purpose is to challenge the status quo, raise new social concerns, or to spur people to fight hard for change, political art has helped to change the face of history. In Preposterous Parade Mike Maxwell and Brian Dombrowsky display new works in the social realist tradition, which confront American politics from both a historical and present day view. Both artists present works that ask viewers to question their personal beliefs and challenge popularly held conventions about American history, culture, and politics. Maxwell investigates the unrest of early America, focusing on the Civil War era from 1861-1865. His acrylic on wood paintings depict key political and military figures and heads of state. With this history/art project Maxwell hopes to create a dialog over what happened between those pivotal years. This is particularly relevant in a moment where we, as Americans, seem to loose track of this nation’s rather young history due to the overshadowing effects of current events. Dombrowsky’s works are inspired by, and make reference to, current politics surrounding controversial subjects such as the Patriot Act, Homeland Security and the corrupt actions of American Political Parties. Like most artists, he observes and reacts to the world around him. Dombrowsky’s work in Preposterous Parade is his reaction to our unusual times and how we, as Americans, choose to engage in social/political issues or conversely, to abstain in apathy. Born in 1979, art has been a part of Maxwell's life for as long as he can remember. Although self-taught he gained much of his inspiration from his Mother and Grandfather both talented artists. Mikes work has been shown nation wide and over seas at galleries in San Diego, Los Angeles, New York, San Francisco, Japan, and Australia. In 2005 Maxwell began curating exhibitions for the Voice1156 Gallery in San Diego where he continues to promote local and national art. Brian Dombrowsky was raised in Westport, Oregon, a small mill town on the Columbia River. After a four year Army enlistment, Dombrowsky attended Oregon State University, where he received a BFA in Fine Arts, and a BA in Graphic Design. Being stationed in Germany provided travel oppurtunities and a yearning for exploration that his hometown rural setting could not provide. After graduation Dombrowsky lived in Portland until moving to San Diego. Upon relocation to San Diego, Dombrowsky worked as a freelance sculptor for various giftware companies in Southern California. Under the tutelage of Willy Whitten, of Sculpture Design Studios, he honed his craft as a sculptor and artist in general, making everything from people to unicorns, magnets to door bell covers. Dombrowsky’s goal is to create work that is visually appealing, and accessible on different levels. As a commercial sculptor he learned to create 3-D objects from flat art. This practice in turn lead to an interest in spatial arrangements on flat surfaces. Estate and modern jewelry, famous designer jewelry, watches and antique timepieces.